It’s not uncommon for people to create fake Twitter accounts, and by ‘fake’ I mean that the purported author (or place, or organization, etc) is not connected to the person who is actually sending the tweets. For example, fans have created accounts for virtually every celebrity, including characters on television shows and in movies. People create accounts for pets or newborn children, with status updates consisting of their imagined inner dialogues. It came as no surprise, then, when @MayorEmanuel showed up in September 2010, but this time the game played out a little differently. 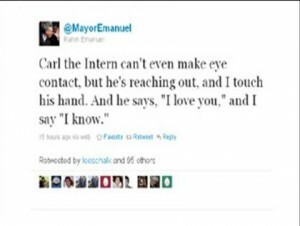 Unlike most fake Twitter accounts, nobody knew who was really behind the @MayorEmanuel tweets, and as any journalist will tell you, the anonymity of a source can be a great blessing and an awful hex all at the same time. For readers, the secrecy made the feed all the more compelling–you didn’t know if the R-rated writing was coming from a political enemy, a disgruntled staffer or a random person having fun by riffing on a very large character. Determining the identity of @MayorEmanuel became a kind of game, but one which was probably not very enjoyable for anyone who feared that the feed could offer too much distraction from the real Rahm Emanuel. The anonymity also posed a potential threat to Emanuel’s mayoral campaign–although after a few days, it must have been clear to everyone that @MayorEmanuel was not created with any real malicious intent. The tweets were simply too funny. And yet, they were more than that. Frequently, they depicted Emanuel as the hungry, ball-busting jackass we’ve seen before, but at other times he was just a guy, sincerely in love with Chicago and truly believing that he was the right man, the only man, for the job. Near the end of days for @MayorEmanuel, this went a step further when @MayorEmanuel was sucked into a kind of time vortex and shown a second version of himself. Yesterday, The Atlantic pulled back the curtain, and we learned that @MayorEmanuel is actually Dan Sinker, a recipient of the Knight Fellowship in Journalism at Stanford and professor of journalism at Columbia College in Chicago. He also founded Punk Planet, a punk zine which closed in 2007, and started CellStories.net, a website distributing stories written exclusively for mobile devices. Now that we know the true identity of @MayorEmanuel, everything changes. Sinker is not only a beautiful writer and gifted storyteller, he is an avid explorer of mobile media and its role in a society where cell phones are nearly standard-issue. He didn’t have it in for Rahm Emanuel, and he wasn’t just messing around for the hell of it. He knew what he was doing. Sinker’s experiment pushed the boundaries of the ways in which mobile media can be used to shape and influence public dialogue and the imagination, and he did so using Twitter, which does the same thing in a variety of ways. Twitter can be used as a news stream, a rumor mill, a confessional, a sounding board and now, as demonstrated by Sinker, a truly compelling vehicle for fictional narrative. Most tweets are like lines of a novel, which taken together create a story about the life of the feed’s author. Before yesterday, @MayorEmanuel had a character, but not an identity. Now it has both, and thus the story is complete.